6. What'll I Do About You? Anyone who can use the phrase “icky poo” in a lyric and make it work is someone to be not just admired but probably canonized. Ah, St. Babbie. Seems fitting. Coming hot on the heels of their first collaboration, last year’s Two, Babbie Green and John Boswell are together again – or perhaps they were never apart. Whatever the timeline, the magic that Green and Boswell began with Two continues full strength on ’Bye Now ... With a subtitle of Notes from Cabaret Country and a cover photo of the two in cowboy hats, one might expect a set more tinged with a country feel. And though there is a good dose of rural rhythm, Green and Boswell refuse to be pegged and freely mix styles on a group of all-new songs by Green (with one getting musical collaboration from Boswell). The result is another absolute winner and candidate for the year’s best. With the pure honesty in Green’s vocals and Boswell’s great keyboard work and vocal backing, ’Bye Now ... flows from the gentle country rock of The Light of the Love and comic delight of Cowboy Hat to the achingly surprising It Don’t Take a Boy (friendship from a totally different perspective) and love loss of And It’s Okay. How love can haunt the soul is at the core of What’ll I Do About You? and how it goes on propels the hypnotic Wherever the Sparrow Goes. Oh, the “icky-poo?” It’s what Small People “leave all over the place.” Small-minded people, that is. As represented here, Cabaret Country is governed by good taste and wit and populated with intriguing songs with its main export being love. 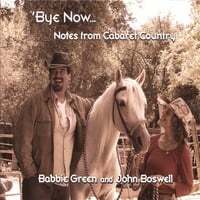 The album title of Babbie Green and John Boswell's 'Bye Now ... Notes from Cabaret Country is also a play on words indicating that the genres of cabaret and country music are mixed ... sort of. Not to worry if either style's stereotype excesses aren't what you like to listen to. There is no hushed nightclubby feel or twangy steel guitars. This material and the performances emphasize the quality that both kinds of music often share: sincerity and directness. Two was last year's delightful CD by Babbie and John, subtitled Duets ... Mostly. This second teaming finds their vocal harmonies sounding even more natural, lived-in - more "right." John is not as prominent vocally this time, but sounds smooth and sure. Most of his previous albums spotlight his work as an instrumentalist, and he's on piano and keyboards throughout, with Babbie also playing. They worked together on the arrangements. All of the songs were written by Babbie, with John collaborating on the melody for "It Don't Take a Boy," an easygoing track. The CD is bookended by a number called "And I Dance" about cutting loose, and they do just that. Two standout tracks feature Babbie's ageless and extra-warm, very natural voice: "Plant Me a Star" and "And It's Okay." The poetic and plainly idealized view of life in "Plant Me a Star" could almost be a ballade from the Elizabethan period, it sounds so pure and classic. Much of the sensibility and sweeter romantic flavor in this collaboration seem like a world long before modern times. And they'll live in my heart 'til the day I die." Miss Green and Mr. Boswell make sweet company for each other and listeners with a taste for the truly tender and tuneful. Babbie and John will appear at the Gardenia in Los Angeles on March 9 and 10 and the Metropolitan Room in Manhattan on April 13 and 14, singing mainly from Two. But by now, Bye Now ... is an album you can buy now at www.CDbaby.com, as it was officially released this month. In their second collaborative cd release, Babbie Green and John Boswell blow a musical kiss at vanishing loves. Two artists stumped by the notion that they have to pick a genre for their work, they simply keep writing and producing good music, good songs...full of intriguing, instantly recognizable characters and stories, riding on melodies and rhythms that carry the listener to wonderful places. Spiced with a taste of country here, jazz there, a dash of pop and folk, these writer/performers won’t be fenced in. Even in the cowboy hats they donned for this project, they still stand at the forefront of the world of music we’ve come to know as “cabaret”. And as seriously as they obviously take their craft, they don’t appear to take themselves too seriously. The songs and their arrangements have a light touch, from the sunniest and funniest to the most poignant. Before their collaboration on their first joint cd, TWO...DUETS...Mostly, Green had two cds on LML Music; Boswell had seven on Hearts Of Space Records. Both multi award winners, their voices, taste, humor and hearts blend beautifully, as writers, singers, and arranger/orchestrators. Boswell’s exquisite keyboard playing highlights and supports every nuance of each song. BIOS and REVIEWS can be found with their cd TWO...DUETS...Mostly...also on cdbaby.